First of all… yeah I know… what a cheesy post title! 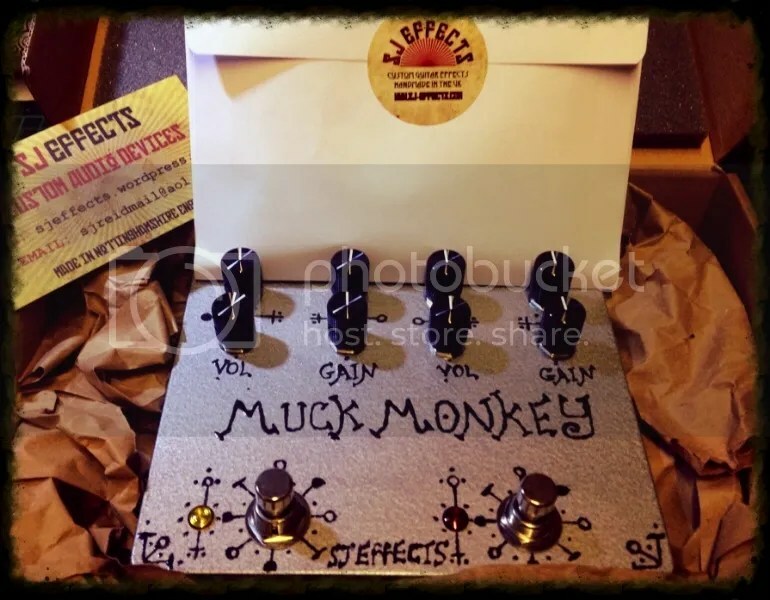 Wampler (fine pedals made in the USA) have posted a neat article on their blog about buffers, and why every guitarist should have one in their gig bag. 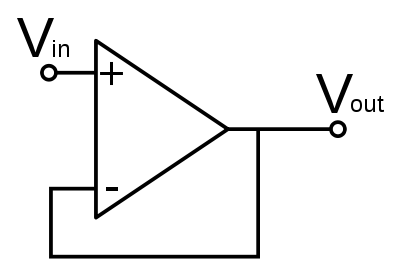 As well as being incredibly useful, buffers are also pretty simple circuits to DIY. 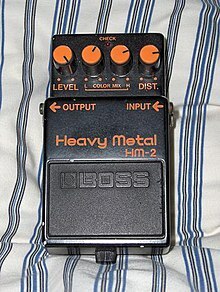 Also, if you are after a buffer, and don’t want to go the DIY route, or shell out on a boutique/bespoke solution, all Boss pedals are buffered bypass, so placing any old Boss pedal in your signal chain is an easy way to get in on the buffering action. Sometimes people complain about their tone being too ‘bright’ when using a buffer, but the reality is they are hearing how their guitar really sounds, before long cable runs cut the treble frequencies of your signal. In my opinion, the real fun happens when using a combination of True Bypass pedals, and a good quality buffer in your chain. Another custom build that I recently shipped! 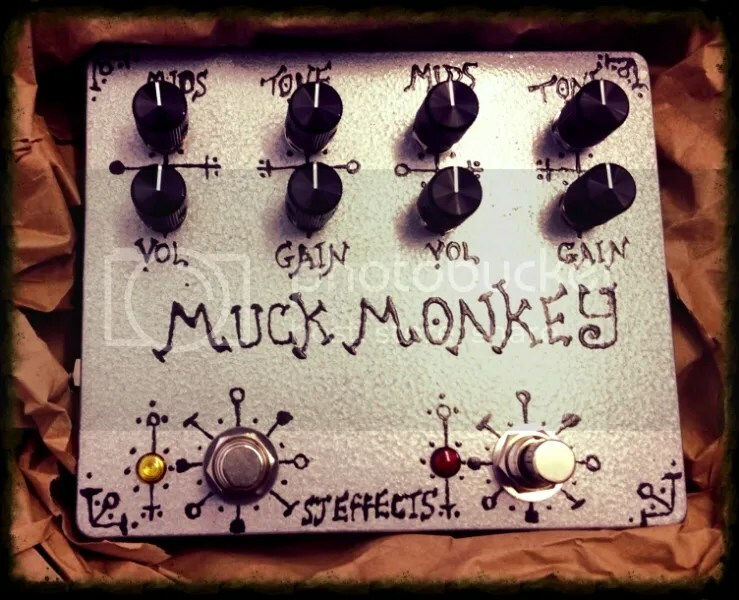 This is a combination of Tremolo and Vibrato circuits in one pedal. 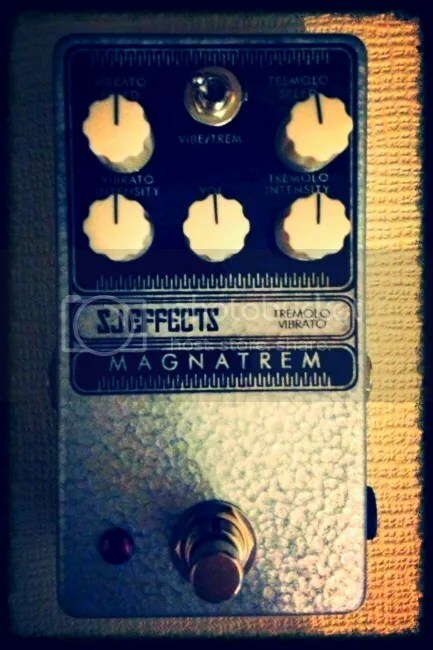 The customer wanted the pedal to have a a similar look to the old Maganatone amps. It also features independant speed and depth controls for both the Tremolo, and Vibrato. The tremolo circuit (based on the classic EA Tremolo) also works really well as a booster with the depth set to minimum! 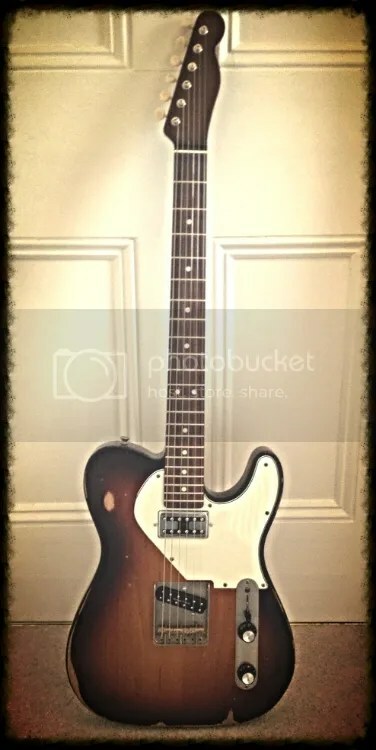 New Guitar Day (Tele Build)! The day all us guitarist’s love… New Guitar Day! 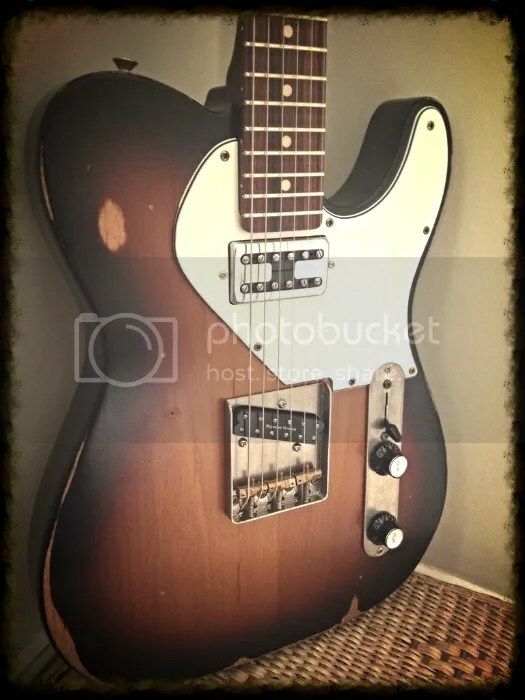 I recently finished my Tele parts-caster build. I was going for a Gibson/Fender ‘Tele Junior’ look and vibe. The neck is a Warmoth stock neck. It is their Boat shape, which is on the chunky side, and feels really nice (similar to my Les Paul). As a comparison it’s a lot comfier than the neck on my Baja Tele (which may even be a smaller profile). The Radius is Warmoth’s 10-16″ compound profile. The necks got a rosewood board, and the main neck material is maple with a brown lacquer finish. I was going to splash out on a full rosewood neck, but the costs were just a bit too high for me to stomach! Most of the hardware is bought from Axes’R’Us, and WD Music in the UK. Wilkinson compensated saddle bridge and Kluson ‘Button’ tuners for a little bit of a Gibson vibe. The hardware is all aged to look a little worn. I cut the Pick-guard on a jigsaw to get that shape. Controls are a standard 3 way switch with independant 500K volume controls for each pickup (I never use the tone control on my other Tele). Pickups are the Seymour Duncan Lil’59 for Tele in the bridge and Creamery UK pickups ‘Hot Swing-O’ at the neck. 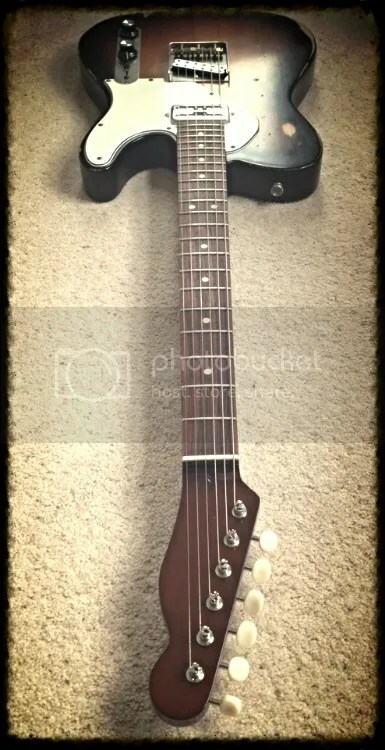 The Creamery pickup is beautiful; probably my favourite Tele neck pickup I have tried so far (link here). You get a really nice open neck tone (almost Strat like), but with more grit and mid-range punch. This pickup is perfect for rhythm playing, and blends really well when mixed with the bridge pickup. The Seymour Duncan in the bridge I am not so sure about yet, I am still looking to see what other options are available for HB size tele single coils. Anyway, I’m loving it so far, and its playing and sounding great… I hope you like the pics! 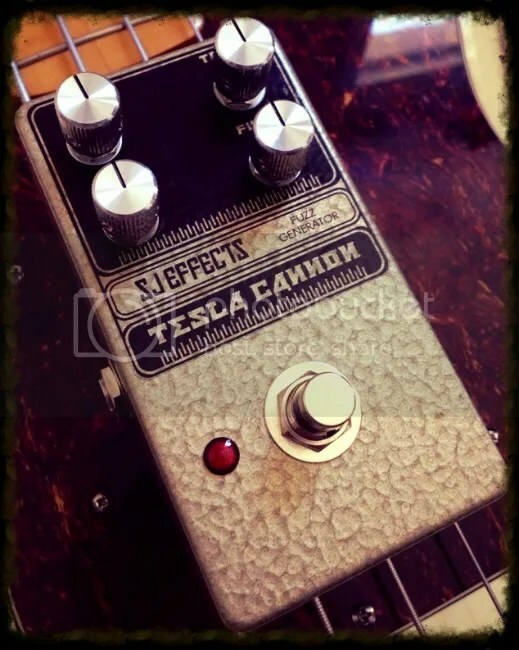 USA boutique store Pro Guitar Shop have a cool article on their blog about 5 influential fuzz tones. 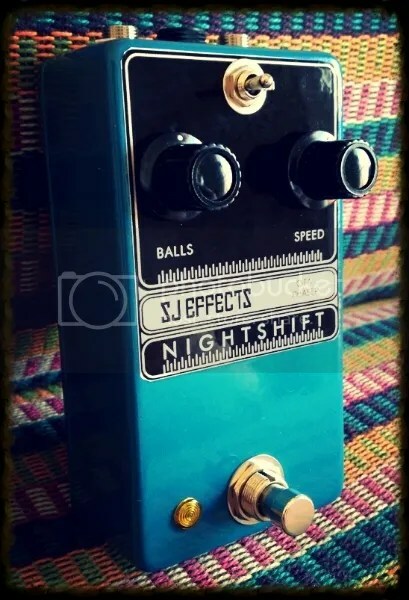 I could argue that there are a few omissions that are worthy of a place in the Fuzz hall of fame though (Mosrite Fuzzrite, Univox Superfuzz etc.)! 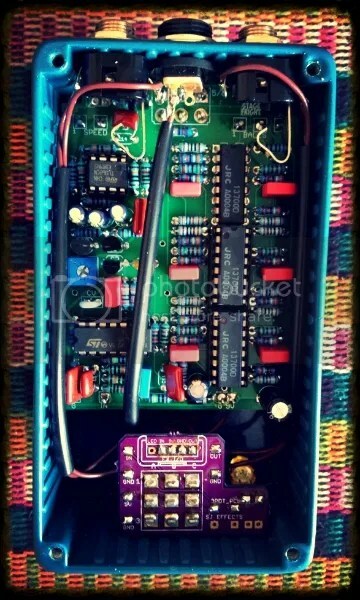 Maestro Stage Phaser clone built on one of Madbean Pedals PCB’s. I went for a slightly different look on this one with the black and white graphic which I think came out cool. It’s sounding great; really nice ‘chewy’ phaser tones, and a nice variant from the usual Small Stone/Phase 90’s etc. It sounds great on guitar, and also sounds great on keyboards, synths, bass etc.